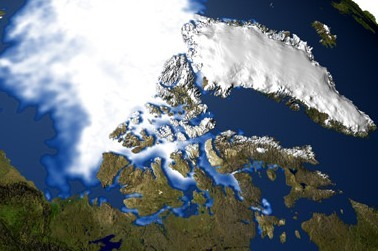 Alterations in global climatic patterns are warming the arctic region of North America in a rapid manner and consequently, melting the polar ice cap. This phenomenon is currently presenting a global crisis concerning international shipping through the Northwest Passage. The Northwest Passage is a strategic route from the Atlantic Ocean to the Pacific Ocean through a myriad of northern Canadian islands. Since the European discovery of North America, explorers throughout the world have been fascinated by the possibility of shipping through this region to commercially link Europe to the Orient. In comparison to the route through the Panama Canal, the transportation of goods through the northern archipelago of Canada would save approximately 4000 km from Europe to the Far East. Unfortunately for international merchants, the Northwest Passage was not traditionally a commercially viable trading route due to shallow waterways and, in particular, ice blockades. Global warming has now altered this reality! Because of climatic changes, the Canadian government is experiencing new challenges from multiple national governments, especially the United States, concerning the feasibility of international travel through the Northwest Passage. This case examines why Canada’s claim of rights to the Northwest Passage is a point of contention between Canada, and various nations of the world. The Canadian perspective is that they have full sovereignty encompassing the islands/waterways and thereby will assert complete control over all activity in that specific region (1). However, many countries perceive the Northwest Passage to be an international waterway between the Atlantic and Pacific Oceans. The Canadian government has continually stated that is does support international shipping through the Northwest Passage, as long as Canadian awareness and regulations, rather than international law, are followed. Newly elected Canadian Prime Minister Stephen Harper defended the Canadian position by proposing to immediately expand Canada’s military presence within their arctic region. It is ironic that the dispute concerning the Northwest Passage has clearly taken an unpredicted shift; initiating international attention. In the past, the concept of acquiring the ability to traverse through this waterway was a dream held by various foreign explorers. It was seen as a channel that could lead to economic cooperation, and social integration. In fact, 16th century Spanish explorers established the title ‘Strait of Anián” used to refer to a yet to be discovered passage route connecting the Atlantic Ocean, to the Pacific. However, during the 16th century, European travelers believed that the entire continent of North America was an archipelago, rather than a large continent with one specific northern water route. Yet, the concept of traveling through North America for trade was always a primary objective. Explorers such as Martin Frobisher and Henry Hudson undertook voyages throughout the North American arctic region (instigating the names of both Forbisher and Hudson Bay). In 1845, 61 year old Sir John Franklin and 134 sailors lost their lives after setting out to discover the Northwest Passage with his two ships named Erebus and Terror. Other voyages, aiming to traverse the Atlantic to the Pacific Ocean via the passage remained unsuccessful until 1906, when Norwegian explorer Roald Amundsen navigated through the northern region in a lengthy three year period. Yet, even though Amundsen was successful in his travel objectives, his success meant little for global trade. The voyage occurred with a smaller craft rather than a large ship, simplifying the travel across shallow waterways. Also, the idea of waiting three years for a shipment of goods to commute from Asia to Europe did little to excite 20th century merchants. In 1969 the oil tanker known as the SS Manhattan, cooperating closely with the US government, deliberately opted to neglect requests made by the Canadian government to seek its approval before traveling through the Canadian arctic to the new oil fields on the Alaskan North Slope. The administrative interest concerning the SS Manhattan rested upon the plausibility of a supertanker traversing the passage for Alaskan oil. The following year, Canada’s parliament felt impelled to implement pollution control legislation known as the Arctic Waters Pollution Prevention Act. The objectives were to “assert Canada’s jurisdiction to regulate all shipping in zones up to 100 nautical miles off its Arctic coasts in order to guard against pollution of the region’s coastal and marine resources”(2). By Canada’s own definition, they were not yet claiming sovereignty over the region, but rather asserting that its arctic region was unique in that it required specific policies to protect the ecological environment. At the end of the Cold War, a number of commercial voyages via the Northwest Passage began to occur. Due to harsh weather conditions, only icebreakers or ice-strengthened vessels made the voyage in this capacity, and the companies responsible had requested permission from the Canadian government (3). Yet in 1985, an American ice-breaker known as the Polar Sea traveled through the Northwest Passage, instigating a political dispute between Canada, and its southern neighbor, the United States. The Polar Sea tested the legitimacy of the Convention on the Law of the Sea (UNCLOS) which was created in 1982 by the United Nations. Article 234 of UNCLOS confirms what is known as the “arctic exception”. Fragile arctic environments are protected more stringently under UN law. The American ship ‘Polar Ice” led to the Canadian Territorial Sea Geographic Co-ordinates (area 7) Order of 1986 that encapsulated the Passage within straight geographic baselines (4). The problem that arose when trying to use straight baselines to encircle a coastal archipelago is that it is neither just land, nor sea. The legal jurisprudence for waters, especially remote, ice clogged, arctic waters, is uncertain (5). The United States agrees with Canada that the islands surrounding the waterway are indeed Canadian territory. Yet, America stands firm on the contention that the waterways between the northern Canadian islands are an international strait. UNCLOS supports the Canadian position in that it prefers the usage of straight baselines (rather than the outline of a country’s land mass) to calculate its territorial area. The straight baseline method allows a country with offshore islands and/or very jagged coastlines to calculate its territorial seas from straight lines drawn from a point on the coast to the islands, or from island to island. One then “connects the dots” literally, and the water behind the lines is designated internal waters, while waters away from the line and toward open waters are considered territorial seas (6). Thus Canada, along with any coastal nation, is actually gaining oceanic territory by exercising the straight baseline method. Canada has consistently asserted its ownership of the waters surrounding its archipelago within Nunavut and the Northwest Territories. In 1986, the nation formally claimed possession of the aquatic region surrounding over 16,000 northern Canadian islands. The international response to Canada’s assertion was inconsequential, since the trade route was ineffective due to its harsh climate and ice blockades. International law expert at the University of British Columbia, Micheal Byers reported that “we’ve essentially been able to avoid problems over this in the past because the ice has been too thick and too hard to make it a commercially viable route…But, of course, the ice is melting”(7). The environment has a direct and highly significant role in the conflict regarding the arctic archipelago of Canada. Human induced, global warming is clearing the Northwest Passage of ice making commercial travel feasible. If global warming did not occur, and the ice blockages remained in place, this conflict would cease to exist. The preservation of Canada’s northern environment is one of the primary arguments defending Canada’s position concerning the federal government’s ability to set regulations for international vessels traveling through the arctic waterway. By establishing national regulations (rather than international), the Canadian military will be legally capable to monitor and patrol one of the most ecologically sensitive regions of the world. The Anderson River MBS in the Northwest Territories and Nunavut’s Queen Maud Gulf MBS are likely to become some of the sites hardest hit by the effects of climate change (8). In Tuktoyaktuk, houses once built solidly on permafrost are falling into the sea, said Colonel Pierre Leblanc, Commander of the Canadian Forces Northern Area in Yellowknife. Others are cracking in two as the permafrost melts and shifts (9). Canadians living in the northern territories have already begun to experience severe consequences due to climatic change. As a result of these circumstances, Canada is firmly defending its sovereign right to monitor its territories and protect its citizens, wildlife, and environment. It appears that in addition to the issue of commercial travel, other concerns regarding natural resources, abundantly scattered throughout Canada’s northern territories, are related to determining the stewardship of the Northwest Passage. Col. Leblanc, Canada’s military commander of the North, is convinced, for example, that the pristine waters of the North (which make up 10 per cent of the world’s freshwater) will eventually become a significant international commodity worth more than oil (10). The fresh water is formed from the Arctic halocline (slope) separating cold, low-saline water from the warmer, saltier levels. Canada’s northern archipelago is also believed to contain substantial oil/gas resources, and valuable mineral deposits. Thus, if Prime Minister Harper is defeated in his objective to protect what he firmly believes to be Canadian territory, a massive quantity of newly accessible natural resources will be available to any nation interested in exploring the waters of Canada’s arctic region. Northwest Passage waterways Canada International vessel traveling without Canadian awareness spills oil, hitting the southern coast of Baffin Island. The dispute concerning the Northwest Passage is both a regional and international issue with the possibility of rapidly becoming a crisis. Canada and the United States are both leading actors, yet the issue essentially concerns any nation interested in international trade via the Northwest Passage. The access to natural resources, and a clear definition of Canadian and international borders are all compelling (“triggering”) issues in this specific case. Thus far, the Canadian government has only threatened to increase military expenditures to broaden supervision of the archipelago of Canadian arctic islands. According to the Special Joint Committee of the Senate and the House of Commons, Canada’s defense policy would have to make various severe changes if the Canadian government ever chose to protect its arctic sovereignty. At minimum, the Canadian military would be obligated to (1) survey and control Canadian territory, waters and airspace, (2) deter attacks on Canadian territory, waters, and airspace, (3) assist provincial governments in Canada, where required, in maintaining domestic peace and security. International law specialist and Professor at the University of Ottawa, Donald McRae clarifies the notion that Canada’s unique geography makes the tasks of protection both difficult and expensive “because of our size and coastline and northern location” (11). This potential conflict is unique in the fact that it is occurring between two nations that possess strong economic, social and political alliances relative to each other. The cultural similarities, and the fact that they are both highly developed nations encourages a diplomatic form of conflict resolution. This diplomatic resolution may not be feasible with nations that are experiencing a higher degree of economic and political instability. Yet, it is important to recognize that the consequence of any plausible misconduct, regarding the mediation process, continues to be rather severe considering that both Canadian national sovereignty and a highly fragile ecosystem are at stake. The alteration of the arctic ecosystem has various long term consequences that will not only affect Canada, but the entire world. Also, issues concerning access to oil, and other valuable deep sea resources should be addressed. Even though Canada’s central priority is to ensure sovereignty in the arctic region, the existing situation relative to the Northwest Passage still presents a direct conflict regarding environmental risk. This ecological crisis will occur because international shipping through the Passage will adversely impact an environmentally sensitive area. Yet, I firmly believe that even though this conflict is directly linked to the environment, it has the potential to cause long-term, as well as short-term obstacles. The long and short-term problems are illustrated within the following causal diagram. The tempo in which the variables increase or decrease are fundamental in determining the severity of the conflict. It will be less detrimental for changes to occur in a gradual manner. For example, it will be easier for arctic wildlife and civilians to cope and adjust to the changing temperatures if climatic alterations decelerate in speed. It will also be much simpler for Canada to gradually increase military expenditures, rather than suddenly augmenting strategic resources to protect national boundaries. The Spatial scope could be considered both global and bilateral. This dispute is global since it will affect the trading activity of many countries. Yet, it is also bilateral since there are only two main actors, the United States and Canada, which are actively involved in the disagreement. The conflict should not be considered a “yield” or “stalemate” because it is unique. This issue may be in the midst of being amicably resolved. Therefore, it is too early in this situation to determine an outcome. -There is a difference of interpretation between the US and Canadian government of the exact boundary dividing the state of Alaska, from northwestern Canada. -The environmental conflict consists of the threat of disturbing a very valuable eco-system by cutting down timber to demarcate a distinct boundary. -The time frame of the conflict began approximately 40 years ago, and continues today. This issue concerns matters of national sovereignty and the well-being of the wildlife and aboriginal inhabitants living within this region. Case #94-The Vikings in North America: Long-Term Climate Change, Environment, Trade, and Conflict. - The incursion of the Vikings from Europe to North America around 1,000 AD led to hostility from Native Americans. -This case study illustrates that a dispute concerning territory due to climate change is not a new phenomenon. -The rapid augmentation in Viking population within Scandinavia, and the warming climate conditions, encouraged a series of expeditions to North America. This case relates to the Northwest Passage dispute since it illustrates that the continuous change in temperature frequency will alter national alliances throughout the globe. It exemplifies that any plausible solution to my case study’s conflict may only be temporary, as temperature on the world’s surface continues to change. -The diversion of the Danube River into a new canal led to damaging effects regarding the relationship between Hungary and Czechoslovakia. -The construction of a reservoir, two diversion canals, and two hydroelectric power plants encouraged domestic energy production within both Hungary and Czechoslovakia, yet the environmental effects were appalling. -The plausible change in the navigational route to fix various environmental effect of the canal would affect Hungarian trade. The Danube Rive dispute is related to the Northwest Passage dispute by illustrating that any sort of agreement that Canada and the US might plausibly agree to could lead to other various predicaments (including social, environmental, international, and national problems). Hungary and Czechoslovakia’s attempt to increase the national energy production within both countries led to various other problems. Case #25 is a reminder that international disputes may never become resolved. Furthermore, government agreements could likely led to an increase in conflict within the region. 1- Huebert, Robert. "Climate Change and Canadian Sovereignty in the Northwest Passage." ISUMA. Winter 2001. Pg. 87. 2-Bilder, Richard. "The Canadian Arctic Waters Pollution Prevention Act: New Stresses on the Law of the Sea. "Michigan Law Review. 1970. pg18-19. 5- Charron, Andrea. "The Northwest Passage in Context". The Canadian Military Journal. 2005. Pg 3. 7- Struck, Doug. "Harper Tells U.S. to Drop Arctic Claim". Washington Post. 2006. A19. 8-"Wildlife in Crisis". Nature Canada. 9- Mitchell, Alanna. "The Northwest Passage Thawed." The Globe and Mail. 2005. 11-McRae, Donald M. Arctic Sovereignty: Loss by Dereliction? 2006. Arctic Waters Pollution Prevention Act, 18-19 Eliz. 2, c.47. April 8, 1970. Bing Bing, Jia. The Regime of Straits in International Law. London: Clarendon Press, 1996. p7. "Bush calls Harper to Congratulate Him on Win." CTV News 26 Jan. 2006. Available at <<http://www.ctv.ca/servlet/ArticleNews/story/CTVNews/20060125/elxn_aftermath_wrap_060125?s_name=&no_ads=>>. Byers, Micheal. “The Need to Defend our new Northwest Passage”. The Tyee. 30 Jan. 2006. Available at <<http://thetyee.ca/Views/2006/01/30/DefendNorthwestPassage/>>. Clarckson, Adrienne. "Her Excellency the Right Honourable Adrienne Clarkson." Rideau Hall. 29 Nov. 2004. Available at <<http://www.gg.ca/media/doc.asp?lang=e&DocID=4323>>. Comte, Michel. 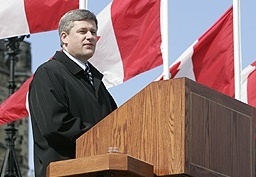 “Conservative Leader Harper Asserts Canada’s Arctic Claims”. Agence France Presse. Ottawa Ontario. Curry, Bill, and Paul Koring. 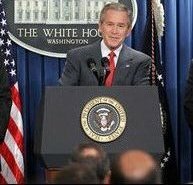 "New envoy Wilson backed Bush on Iraq." Globe and Mail 16 Feb. 2006. Bell Globemedia Publishing Inc. 17 Feb. 2006. Harper, Stephen. "Harper Stands Up for Arctic Sovereignty." Ottawa. 22 Dec. 2005. Available at <<http://www.conservative.ca/media/20051222-Speech-Harper-Winnipeg.pdf>>. Johnston, Douglas. “The Northwest Passage Revisited”. Ocean Development & International Law. Taylor and Francis. 2002. Joyner, Christopher. “Canada’s Arctic Waters in International Law”. The American Political Science Review. American Political Science Association. Vol. 83, no. 3. pp 1091-1093. McRae, Donald M. Arctic Sovereignty: Loss by Dereliction? March 20, 2006 <<http://www.carc.org/pubs/v22no4/loss.htm>>. Mitchell, Alanna. "The Northwest Passage Thawed." The Globe and Mail (2005). 18 Jan. 2005 <<http://www.carc.org/whatsnew/writings/amitchell.html>>. Sevunts, Levon. “Northwest Passage Redux”. Washington Times. June 12, 2005. Struck, Doug. “Harper Tells U.S. to Drop Arctic Claim”. The Washington Post. January 27, 2006; A19. “Wildlife in Crisis”. Nature Canada. Ottawa Ontario Canada. Available at <<http://www.cnf.ca/pdf/nwa_crisis.pdf>>.